Daniel Berg (NAE '76) has long been an active member and generous supporter of the National Academy of Engineering. 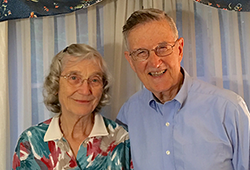 This year marks his 40th anniversary as a member, and to celebrate, Berg and his wife, Fran, are "giving big" and joining the ranks of the Einstein Society  whose members' cumulative lifetime giving is $100,000 or more. In addition, they have become members of the Heritage Society by naming the NAE as a beneficiary of their estate. "As a professional, NAE has made an enormous impact on me. This is an opportune time to do something bigger," Berg explained. "I've been hoping to become an Einstein member. I thought this would be a nice time to recognize the organization's meaning to me, and what NAE does  not only for the country, but for the world." Over the years, NAE has provided countless opportunities that have helped him advance professionally, Berg said. A former president of Rensselaer Polytechnic Institute, "I truly believe NAE has helped me in my career  not only through the connections I've made but also by broadening my scope and getting me involved in new things." Even more important, he says, is the opportunity to support the NAE's work. "For a relatively small budget, NAE's impact is incredible. Dollar for dollar, it's a very high return on your investment. It's an organization that provides advice that is grounded in study and analysis. The goal is to do the right thing for society."